scientific community: integrate and provide advanced knowledge (e.g. fungal and plant genomics and transcriptomics, metabolomics) on the mycotoxin producing fungi and their hosts by improving global communication, international networking and dissemination of innovative research results with the open access publications and the support of scientific societies. The project will contribute effectively to introduce innovations able to create a new model to handle the mycotoxin management, by integrating technologies and driving users to apply the MycoKey solutions in a smart and simple way (app). This contribution will be relevant as it will be obtained by merging different and several inputs coming from scientific, industrial perspectives, including European and global markets and research, by involving Supporting Partners and International experts. The project will have impact on social innovation, by opening the way to new solutions to be applied at large scale by food and feed safety communities. New skills will be developed and job opportunities created. The project outcomes will be reinforced by a favourable European scenario of the next ten years: food and feed safety and innovation represent pillars of European policy and they will be included in the upcoming funding programmes (i.e. Kic Food launched in 2016), also at national and regional levels (i.e. National Framework Programmes). 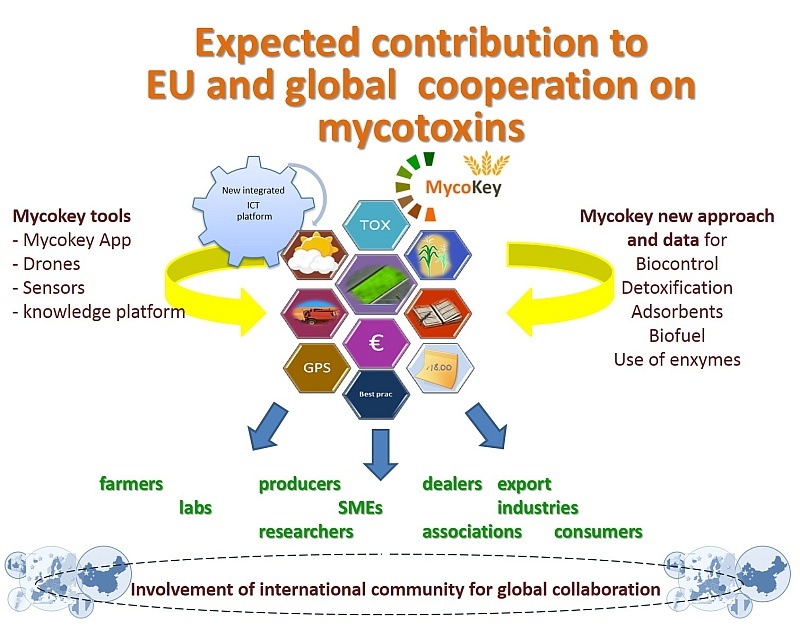 The MycoKey partners will capitalize the results during and after the end of the project, through national projects, and will apply the developed solutions at local level, by joint projects with companies, thus contributing to European Regulations, national policies and consumers awareness on food safety (by providing smart technologies application).